On the occasion of the Global Week of Enterpreneurship, on November 20 we held a Veg Sausage Fest at City Center One in Zagreb where we presented various types of sausages, salamis, and frankfurters made exclusively from plant-based ingredients by Croatian companies and individuals. 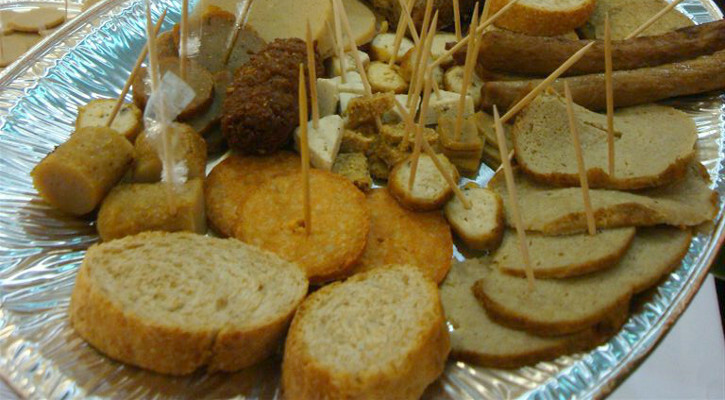 A special jury chose the product Zrno krvavica in the category the Best sausage, Tofu salama natural in the category the Best salami, and Zrno hrenovka in the category the Best frankfurter. Visitors chose Veggie kulen as the best product. As a part of the campaign against abandoning of companion animals we organized visits of children and teenagers to the Shelter for Abandoned Animals of the City Zagreb in Dumovec. With this project we want to present the problem of abandoned animals to the young and to point out the necessity of improving the treatment of animals in order to successfully build a violence intolerant society and to encourage a more compassionate lifestyle. The project is conducted in cooperation with the City Department for Agriculture and Forestry and the City Department for Education and Sport. In order to show the repulsive custom of home slaughter, on November 27 in Osijek we held a performance during which one of our activists was ‘slaughtered and hanged upside down so as to bleed to death’. Thus we wanted to remind of the enforcement of the new Animal Protection Act, according to which a pig may only be slaughtered if it is stunned before slaughter, (Article 17, paragraph 1 and Article 19, paragraph 3). Penal provisions for those who break the law are from 10,000 to 15,000 kuna. We also invited the citizens not to participate in the killing of live creatures and to think about changing their diet to a more ethical and ecologically acceptable one, which also is more healthy. First Croatian Band Aid for Animals Finally on the Air! On December 3 we held a promotion of the song ‘No Excuse (Nema isprike)’ of the first Croatian band aid for animals in The Regent Esplanade Zagreb hotel. The following singers contributed in the band aid project ‘I LOVE ANIMALS’ by giving their voices for the animals: Marko Tolja, Tina Vukov, Toni Cetinski, Jelena Radan, Oliver Dragojevic, Ines Bojanic, Lea Dekleva, Lana Banely, Maja Vucic, Massimo Savic, Iva Bagic, Detour, Leona Paraminski, Popper, Klinci s Ribnjaka, and Zagrebacki malisani. Through the SOS telefon and our on-line donations we will raise funds for the building of the first sanctuary for abused animals in Croatia. You can listen to the song ‘No Excuse’ written and composed by Lea Dekleva at http://www.prijatelji-zivotinja.hr/data/nemaisprike.mp3. The video clip can be watched on our YouTube channel http://www.youtube.com/watch?v=c_wvGP6XVrk. On Wednesday, December 10, in front of the Pet Center in Zagreb we held a performance against the trade of animals as a part of our campaign ‘Animals are No Merchandize’, whose aim is to reveal cruelty and unethics of animal trade. On our web portal we added the Black and White List of Croatian stores that do (not) sell live animals. Please buy food and supplies for your companion animals only in the stores which do not sell live animals, and boycott those who sell them. – On the grounds of investigation carried out by the BUAV about the dreadful suffering endured by monkeys trapped in the wild in Cambodia to populate appalling industrial-scale factory farms which supply the global animal testing industry, we sent a protest letter to the government of Cambodia, European Commission and CITES. – AFC activists joined our colleagues from Slovenia in a performances against fur in Maribor (November 15) and Ljubljana (November 29) and also our Austrian colleagues on the big anti-fur demo on December 13 in Graz, during which one store gave up on selling fur! – Among news on our web site please find the article Face the Truth – Fur and the master thesis Pig Welfare in Croatia, whilst on our YouTube channel we have translated PETA’s video about pigs and dogs. – We invite you to the big anti-fur protest which will take place in Zagreb on February 28, 2009. The gathering point is King Tomislav Square at 11 A.M. For our other activities please visit our Calendar of Activities. We thank you all for your continued support! Hopefully you’ll stay with us until the next issue of our newsletter!